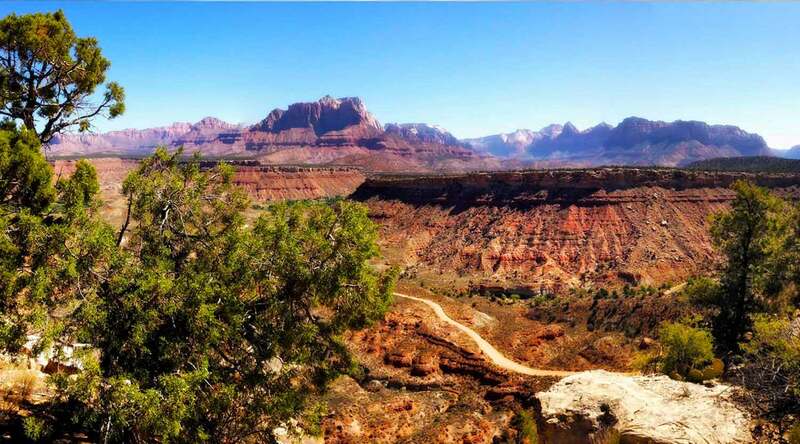 Zion is known to be a colorful landscape, but fall brings an even wider range of hues to the local scenery. Many visitors are finding that October & November is the ideal time of year to visit Zion. With moderate temperatures and smaller crowds, this is the favorite season for many of the people most familiar with this region. Some of the best scenery is found at the higher elevations, many of which are accessible only by 4-wheel drive. Wildlife is more plentiful, sunsets are more vivid, and hiking is more pleasant in the fall. Zion has some great fall events. Zion’s Plein Air Painters Festival. The “Red Bull Rampage” has been held above the town of Virgin for several years in a row, and Zion Outback Safaris provided transportation for officials, volunteers and spectators. This event features death-defying stunts performed by some of the most amazing mountain-bikers in the world. Another favorite event is the Zion Plein Air Painters Festival sponsored by the Zion Natural History Association. Many of the nations best landscape painters converge on the area for a week of demonstrations, sales, and celebrations. Collectors, artists and spectators are finding that this has become a “can’t-miss” activity each November. Wildlife photographers enjoy coming to Zion in the late fall to capture images of Mule Deer during the “rut,” when bucks fight for the right to influence the population of the local deer herd. Bucks become less wary and more likely to show-off their large antlers to an audience of appreciative does and spectators, and jealous young males who must wait for another opportunity to do what bucks do best. Visit Zion in the fall. You’ll love the weather, the colors of the high country, and the special events that make Zion such a great place to visit. Zion Outback Safaris can make your visit even better with a back country tour while you are here.